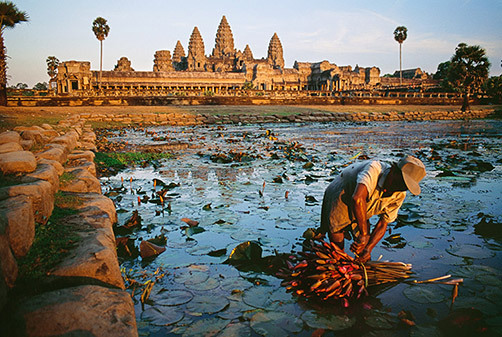 The population of Cambodia is currently around 15 million citizens and is comprised of several different nationalities. These include Khmer, Chinese, Vietnamese and Thai populations. Most Cambodians speak the language known as Khmer, although many dialects of Chinese are spoken among several different minority groups. Cambodian culture as a whole is very interested in acknowledging and respecting various rankings, and therefore counts elders and managers as superior. For this reason, natives tend to ask traveling foreigners some pointed questions. They do this principally to decipher your rank, so they can determine how they should address and interact with you. Cambodians are a collective society, which means that they will go to great pains not to offend anyone and will sacrifice their own desires for the good of the community. 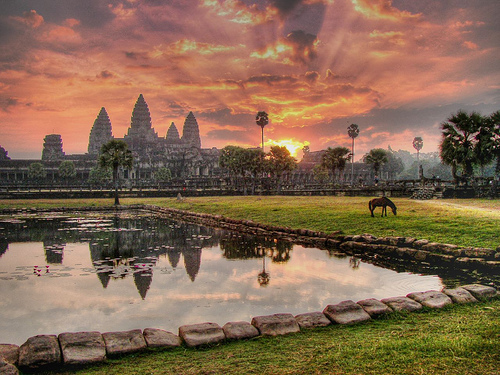 Bordering the Gulf of Thailand, Cambodia’s terrain is as vast as it is varied. To the south, tropical islands dot the coastline. To the northwest, mountains and wild country have an abundance of waterfalls throughout. In between, there is everything from tropical wildernesses to well-developed metropolitan areas. There are two primary seasons in Cambodia, one of which is very dry (early November to March) and the other of which is very wet (mid-May to early October). Short transitional periods often usher in dry air that is a little cooler than average. Still, temperatures in Cambodia do not typically range far from its average of 25 degrees Celsius. The region is known for the seasonal monsoons (strong winds) that can carry with them large amounts of rain in the wet season and dry air in the dry season. Cambodia is remembered most for the atrocities that occurred within its borders during the 1960s and 1970s, when the Khmer Rouge emerged and quickly rose to power. The Cambodian holocaust that resulted from this reign of terror is forever etched into the minds of both Cambodians and the entire global community. The Killing Fields, where multitudes of people were killed and then buried en masse, can still be visited today. 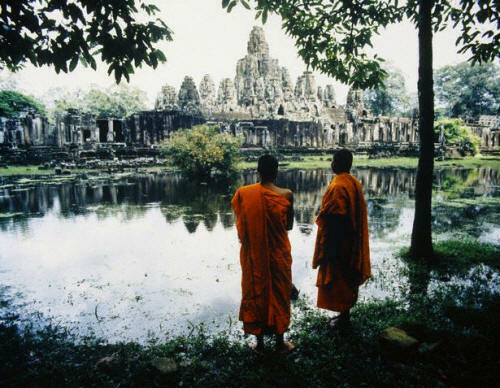 While the Khmer Rouge has left a particularly distasteful imprint on Cambodian history, the country actually enjoys a rich recorded history that stretches all the way back to the first century A.D. From Indian influences to French colonialism, Cambodia has a history of being greatly influenced by both the friends and foes that surrounded her in any given era. While this country has a long history of war and bloodshed, its future, at present, looks promising. The capital city of Cambodia, Phnom Penh, boasts the country’s largest population, which is just shy of one million residents. Like any major city, it is full of energy, culture and plenty of things to do and see. 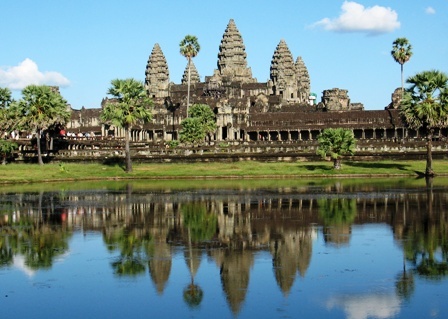 Another thriving city that has just recently been revitalized is called Siem Reap. This high-end city is now considered the epicenter of the new Cambodia. Spas, dining hot spots and hotels can be found in abundance, which makes it a top destination for travelers with a hankering to be pampered. 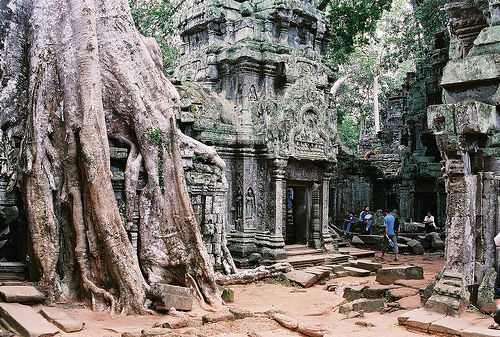 This city also serves as the primary access point for anyone that wishes to visit the famed temples of Angkor. For those interested in a more low-key, outdoors look at Cambodia, Kampot is a great option. This seaside town is located very near Bokor National Park. Hiking the trails that weave in and out of the large, protected forest, you have the potential to enjoy a firsthand look at endangered species such as the Indian elephant and the yellow-throated martin. Cambodia offers a nightlife scene that caters to locals and tourists alike. The country’s capital of Phnom Penh comprises a good deal of the nightlife scene, as it is so densely populated and frequented by tourists. The bar and dance club scene is split in two, with some venues catering to westerners and other catering primarily to locals. Music and drink venues range in size from tiny holes in the wall, to larger establishments that can accommodate big crowds. Many of the smaller venues do not experience high traffic, though they still operate, and new small venues open up practically every day. The nightlife scene does not get started until half past ten, when it really comes alive. Traditionally, Cambodians wear a checkered scarf called a Krama, which serves a number of different purposes (fashion piece, baby hammock, towel, etc.). Many of their other clothing items have to do with religious beliefs, such as Buddhist pendants and Hindu shawls. Cambodians enjoy feast days that are replete with music and traditional dancing. The Pinpeat Ensemble is a popular sound in the country, comprised mostly of percussion instruments. Sweet, sour, salty and bitter are the four parts of the palate that Cambodians seek to appease every time they sit down to eat. To this end, they typically serve multiple dishes every meal, with each different dish highlighting one of the four elements of taste. Curry dishes are a favorite and can be cooked with a wide variety of meat and fish. Many Cambodians enjoy adding coconut milk to their curries for a delicious contrasting flavor. Rice noodles are a standard and multitudes of recipes use them as their base. The use of a fermented fish paste named prahok is a trademark Khmer ingredient. The paste has a very distinctive taste that can be found in many dishes.